Managing hundreds of test tubes at a time requires timesaving methodology and flexibility. How do you quickly dispose of a contaminated batch? What if it’s cheaper to use new racks rather than to re-sterilize? What is our real solution to this real problem? The Whitney Medical Solutions Test n' Toss Disposable Test Tube Rack. The Test n' Toss Disposable Test Tube Rack is perfect for clinical labs, hospitals, research labs, reference labs, EMS, even physician offices and alternate care sites. The Test n' Toss Disposable Test Tube Rack is designed with the lab professional in mind. It holds up to eighty 16 x 100 mm tubes in a leak-resistant plastic shell to contain spills. Clear walls allow you to see rack contents. Uniquely designed divider shelves can be used singly or in pairs for extra tube stability. Use a second shell as a cover to completely enclose contents allowing racks to be stacked for transport or storage. 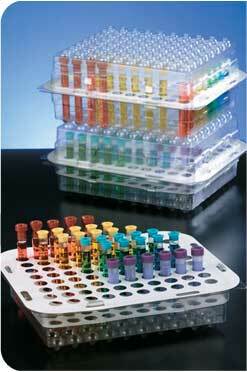 Economical - Less expensive than standard test tube racks. Disposable – Easily discarded when contaminated, in accordance with local regulations. Transportable – Readily carries samples when assembled with optional cover. See-Through - Clear construction allows visibility of contents. Leak-Resistant - Enclosed base contains drips and spills, keeps work area clean. Closable - Encloses samples and prevents spills when assembled with optional cover. Stackable - When closed, can be stacked to save on storage, incubator, or refrigerator space. Cold-worthy - Can be refrigerated to 0° F (-18° C). Heat-tough - Can be incubated to 140° F (60° C). Considering a more convenient option for your lab? Contact us today to request a free sample of our innovative lab products and see for yourself how convenient and economical our products are.